Dicalcium Phosphate poultry feed grade is an organic diet of mineral phosphate because bones meal and meat are not allowed in poultry industries. Dicalcium Phosphate uses as Nutritional supplement diets with feed formulations. Major part of poultry birds required is phosphate and calcium natural feedstuffs in their diets. Calcium and phosphorus are essential for skeletal development and normal growth with during the egg production period, for the formation of strong egg shells. So it is important phosphates reliable sources. 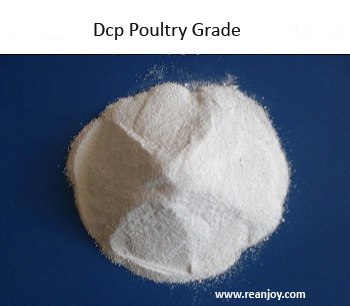 Reanjoy is a quality manufacturer of poultry grade DCP (Dicalcium Phosphate). Our rock based product goes through a series of accredited quality phases ultimately to the packaging unit. Dr. Jagveer Singh Chundawat is a highly qualified organic chemistry expert who has brought his many years of experience to serve the home state of Rajasthan but we also regularly supply to the rest of India like Gujarat, Haryana, Punjab, Himachal Pradesh, Delhi, Utter Pradesh, Madhya Pradesh, Tamil nadu, Andhra Pradesh. Potential clients are invited to talk directly with the service owner and visit the production plant for a direct assessment. The poultry grade product is substantially low in fluorine content, in the range of 1000 ppm. This makes it effective both for direct table use and also to be used for removing moisture from poultry food-stock. Ours is also an international supplier service. Get in touch with the exporter department through our contact details easily visible on the service website. We manufacture the ionic salt compatible with international standards. All our existing clients report good results in their poultry farm with more active and healthy chickens. In addition, we maintain the ultimate concern that the DCP elements should be fit for human digestive system as well. The naturally low amount of calcium in DCP helps you to provide the vital nutrient in balanced supply. Calcium serves several crucial functions but an unbalanced excess of it can disrupt the vital Sodium-Potassium balance of the neural system.